Large studio space that can accommodate up to 45 people with option to heat for a hot yoga class. For more information or to book your room rental, contact us at info@asha.yoga or 450-686-9642. A healing technique based on the principle that the therapist can channel energy into the patient by means of touch, to activate the natural healing processes of the patient’s body and restore physical and emotional well-being. To book a Reiki session with Alyssa, please call (514) 813-3120. To book a Reiki session with Tamara, please call 450-686-9642 (please note that she offers treatments on Thursdays only). *Insurance receipts available with Alyssa only. 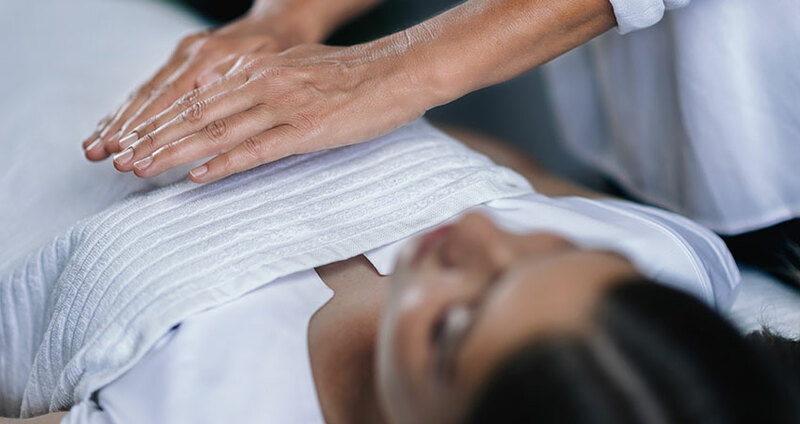 Massage therapy is an effective way to help heal the body while releasing the pain and tension that limits the mobility and happiness in our day to day life. The continuous collaboration between yoga practice and massage therapy ensures an excellent integration of care with a focus on preventative medicine. Both practices renew tissues and helps to restore our body/mind complex to balance. To book a massage with Maude please call (514) 664-9642 (Insurance receipts available). Click here to view our Policies and Guidelines.